• RS-232C interface as standard. [Remote start mode] [FAST] 100msec. [SLOW] 450msec. 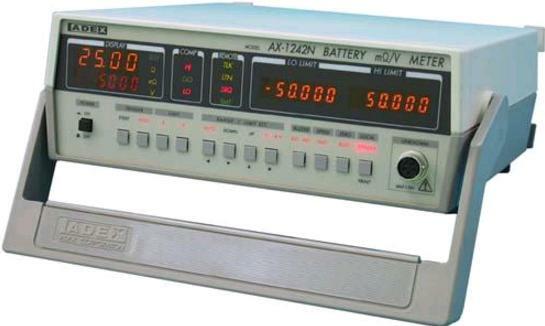 AX-1242N Battery mΩ/V meter (Batter iR/OCV tester) inspects to measure internal resistance such as battery having electro motive force and voltage at the same time. Contact-check function as standard equipment: When measure 4 terminals, either one contact failure occurs, outputs Contact Error signal. Free running mode : 5 or 15 times/sec. Remote start mode : about 24msec./110msec. 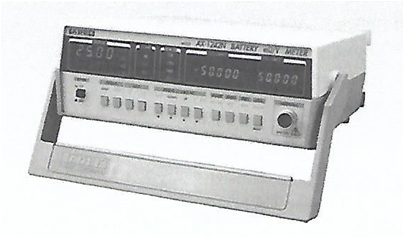 AX-1262B Battery mΩ/V meter inspects to measure internal resistance like battery having electro motive force. Contact check function is standard equipment: When measure 4 terminals, either one contact failure occurs, outputs Contact Error signal.